Watch: Usain Bolt now races in zero gravity! Usain Bolt has now proved that he's the fastest even in space. 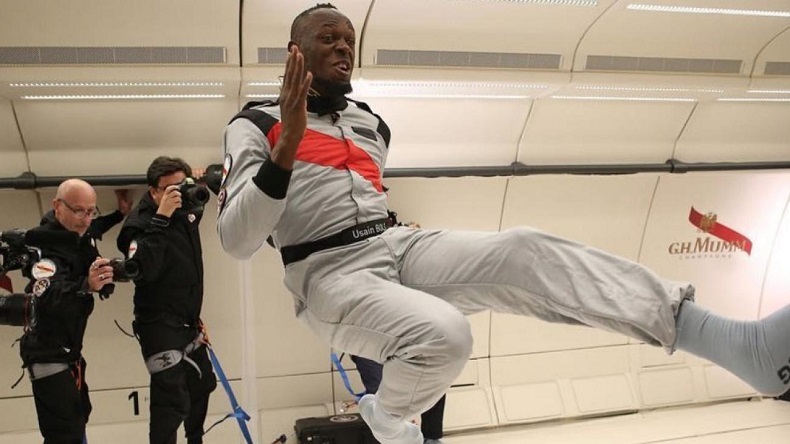 Bolt, who is making efforts to become a professional soccer player, after his space experience said that he felt like a "kid in a candy store" after spending about four minutes floating and joking around in near-weightless conditions. Bolt has now proved that he's the fastest even in space. 3-time Olympic champion and one of the greatest sprinters of all time, Usain Bolt has now proved that he’s the fastest even in space. Bolt recently boarded a special Airbus Zero G plane that that mimics what’s it like to be in zero gravity, and challenged 2 fellow passengers for a race but what’s interesting is that he won it like a boss. According to reports, it was French astronaut Jean-Francois Clervoy and CEO of Novespace and French Interior designer Octave de Gaulle, who tried to match Bolt but failed. That’s not it, after his win, he celebrated it in the same style showing his trademark and by opening a bottle of champagne. “I was nervous but as soon as the first one (parabola) goes you kind of go ‘oh my God, what’s happening’. But after the third one I was like ‘yeah, it’s crazy’,” Bolt was quoted as saying by Reuters TV. The Champagne bottle was designed by champagne-maker Mumm. It will allow astronauts to drink bubbles in space. In time the company hopes to capitalise on the advent of space tourism. At a time when Amazon and Tesla are in a race to send wealthy tourists into suborbital space, high enough to see the curvature of the planet, the champagne maker Mumm now seems to be the winner as whoever wins Jeff Bezos or Elon Musk, champagne will be there for the tourists. Bolt, who is making efforts to become a professional soccer player, after his space experience said that he felt like a “kid in a candy store” after spending about four minutes floating and joking around in near-weightless conditions. The 3-time Olympic champion is making efforts to become a professional football player. He’s currently practising with Australian side Central Coast Mariners and has also made his debut on the left wing in a trial match.